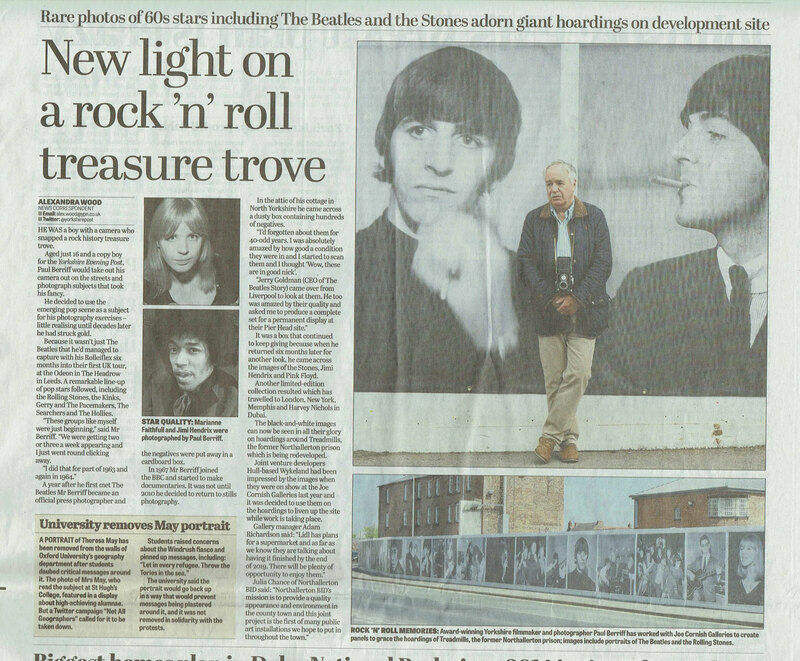 A striking new open air exhibition is being installed in Northallerton – celebrating pop icons from the 1960s. Award winning Yorkshire filmmaker and photographer, Paul Berriff, has worked with Joe Cornish Galleries to create panels to grace the hoardings of Treadmills – the former Northallerton prison. Supported by Northallerton BID and site owners the Central Northallerton Development Company Limited (CNDCL) the 150 metre long graphic features rare images of artists like The Beatles, The Rolling Stones and Jimi Hendrix as they toured Yorkshire venues at the start of their careers in the early 1960s. “Inspired by big city developments around the world, we are excited to be using iconic pop culture to enhance the look of the town while the prison site redevelopment takes place” said Joe Cornish Galleries Manager Adam Richardson. The multi-million pound redevelopment of Northallerton’s former prison is to pay homage to its historic past. The 3.5 acre site is to be called ‘The Treadmills’ recognising that not only was the prison home to the world’s largest treadmill, but that at one time the number of wheels at the prison ran into double figures. 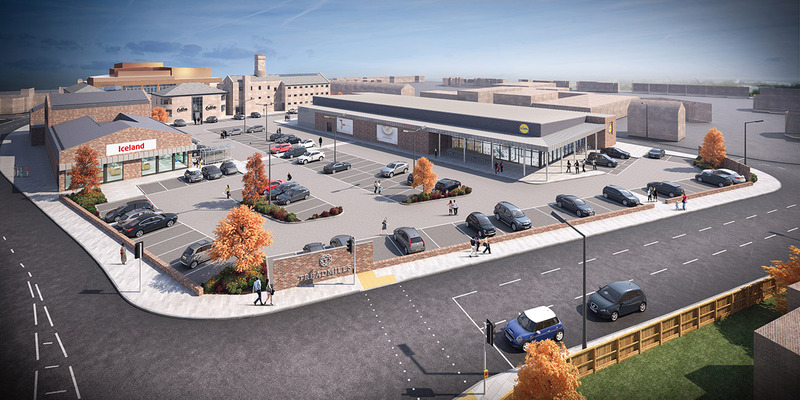 Hambleton District Council and the Hull based Wykeland Group have formed the Central Northallerton Development Company Limited (CNDCL), to drive forward the regeneration scheme – which will include shops, managed workspaces, restaurants, a cinema, heritage centre and an area for public events. “The name reflects the prison’s history and makes sure we never forget what life was like for prisoners behind those famous walls,” said CNDCL Board Chairman, Councillor Peter Wilkinson. Already much of the old prison has been demolished – leaving just five listed buildings which will be incorporated into the development, and the gatehouse which will be removed as part of the project. Archaeological work has also been undertaken which revealed the foundations of the large treadmill. It is believed there could have been as many as six ‘mills’ in the prison at one time – with women and men being put on the wheels as punishment. They were also used to pump water around the buildings and grind corn for the local farmers. A planning application for the regeneration scheme – including details of phase one which includes two retail sites and car parking – is expected to be lodged this summer. Northallerton Prison dates back to 1780 and housed prisoners for more than 230 years before closing in 2013. Hambleton District Council bought the site from the Ministry of Justice in 2014 to secure a key strategic site close to the town centre for development.